I did another portrait study. I painted her hair rather abstract. I tried to form some kind of design to make portrait painting more interesting. more paintings and experiences are needed, but I surely had a lot of fun. I am on my way to my next workshop teaching, and I will let you know how it goes. After my previous post, I have received so many kind emails and comments about the magazine article on my art. I feel like a marathon runner passing a milestone. I am really touched by your cheers. I took the water bottle you handed to me, quenched my thirst, energized my body, and kept on going. I know well I have a long way to go, but I believe I can make it, because you are with me no matter where. Thank you very very much. I want to share this small painting with you today. I am exploring new possibilities of using light. I like the reflections from the red table cloth to the small white pot. I can't believe I can put cadmium red light directly on a white object. I like the drama. Please allow me to brag a little today. 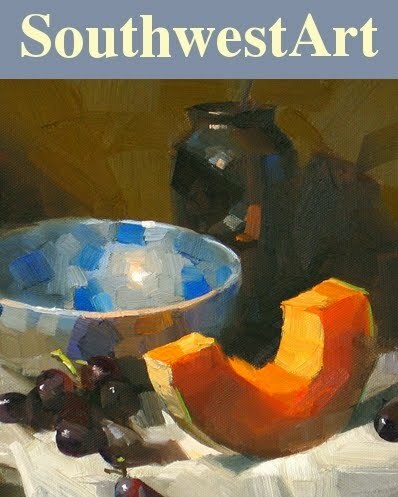 I am so excited that I have been featured on the March issue of the Southwest Art Magazine. You can read a rather detailed story about my art and me. If you don't have the hard copy of the magazine, you may read the article online from the Southwest Art Website. Recall the journey I made so far in the art world. I feel very happy. I really enjoyed this big and wonderful community. People in it are so positive and supportive. I want thank you all. You make me feel meaningful. This small painting was done at my country home. I didn't use artificial light at all. Both the setup and my canvas was under true north light illumination. I really enjoyed the subtle color changes on the kettle. After cutting down my engineering working hours, I can paint during the day sometimes. I am amazed what natural light can offer. I talked my country home before. It is two acres in Texas Hill Country. There is a mobile home on it, not in good shape. I am off the grid. I made a solar panel that provides me lighting during the night. I have to haul water from the creek down in the valley. I can cook with a camping gas stove. Last night was my first night staying here. Everything is rather primitive, but I feel good because I am in control. Not like my city home, I feel I was controlled by the house. My country home is my experiment of real living. I am reading Henry David Thoreau, and my country home is my Walden. 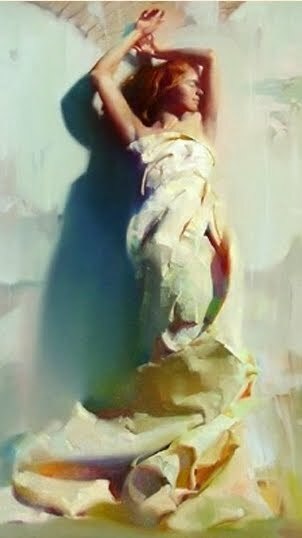 Zhaoming Wu is an internationally well known figurative artist. He has the secrete of creating spectacular figure paintings just like the image above. Please check Zhaoming's website to see his incredible art work. I am very excited to announce that Zhaoming Wu will come to Austin in May and teach a 5-day figure painting workshop. Song and I are extremely happy to organize his workshop. Please check the workshop flyer for information and sign up. We will try our best to assist you in studying with this modern master. "Memory of the Old Days"
Recently, I didn't post as frequently as I wanted, but I was literally a daily painter. I painted everyday. Instead of doing many small paintings however, I did only one, but a relatively large painting. I have spent more than 10 day on it. This one is different from most of my paintings. I emphasized on the subtle details, but not much to the boldness of the paint quality. This was a wonderful exercise for me. I practiced more on the long term painting process. I was confronted in many areas that I was lack of skills and ideas. For a couple of days I was in real ageny (spelling? the checker didn't work today). I wanted to quit many times, but I am glad I didn't. I think I have grown quite significantly by doing this serious painting. I am going to submit this painting to this year's Oil Painter's of America National Exhibition. I hope I get lucky. This is another rose study I did recently. I have posted this painting as a "Challenge" on the Daily Paintworks website. You are welcome to take the challenge, paint a red rose, and submit the image of your painting to Daily Paintworks Challenge. I am looking forward to see your rose there. Happy painting and happy Valentines day. I have painted too many still lifes, and I hope you don't get bored with them. For a change, my today's painting is a portrait. I did it on Monday night at my friend Eric's studio. Addie is a very beautify high school student. She came to Eric's home as a baby sitter that night. It has happened that our model could not come. After all the children went to bed. Addie sat for us as first time modeling. She is a very good model. Her facial features are perfect. As a still life painter, I don't know human anatomy enough. However with a perfect model like Addie, I had a very easy ride. I like this portrait a lot. So I am going to keep it for a while. After my Sacramento workshop, I went to the Bay Area and visited my friend Fongwei Liu. He is a wonderful figurative and portrait painter, and teaches the graduate level painting classes at Academy of Art University in San Francisco. If you are not familiar with his work, I highly recommend you check Fongwei's art blog. You will be amazed what this young artist can do. He has won an award last year at the 12th Annual International Portrait Competition hosted by the Portrait Society of American. In the near future, I will invite Fongwei coming to Austin and teaching a workshop. I will announce that when the workshop is confirmed. With this painting I demonstrated how I do onions. A group of workshop artists set it up for me. I liked the subtlety of the colors. I had a wonderful time in Sacramento, and I will go there again. Today is the Chinese New Year (Rabbit). I'd to wish all of you 新年快乐 (Happy New Year)! This is the second demo I did at the workshop. The photo is not very good, but you get the idea. Sometimes, I like to set a dark object in front and keep my major illumination behind it. The contrast can enhance the light effect on the center. Today, mercury lamps are shining on black cubicles in a concrete building under a freezing 25 F outside. Yesterday, lemon trees were shading pink flowers on a grassy sidewalk in cozy 65 F breeze. Hello my friends. I just came back from California last night, now trying to catch up what I missed those several days in Austin. I did a workshop at Sacramento. I want to thank Patris and Scott of S12 for having me back. It feels so good of seeing old friends. Moreover, I am excited meeting all new friends there. Thank you all so much for keeping me going. I really enjoyed your company. This is my first demo I did. I hope you like it.